For centuries, people have asked why God allows pain and suffering. Bestselling author, Bonnie Baker, makes a compelling case regarding the meaning behind hardship is an essential component of our relationship with the Lord. Whether it's her near-death experience or her miraculous recovery from a stroke, Bonnie describes how burdens which come with pain – whether spiritual, emotional, mental or physical – can be hard to bear. 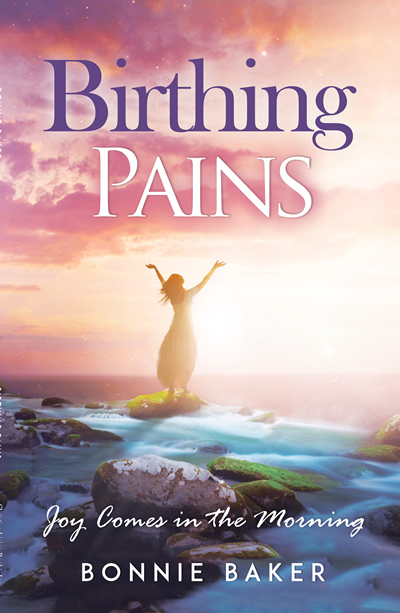 Using the metaphor of labor and delivery, biblical wisdom and personal testimonies of overcoming adversity, Birthing Pains is an invaluable guide to a difficult issue. God's promises that when you “walk through the fire...I will be with you.” Avoid despair. Learn to PUSH your blessing to fruition.